Feline pet owners often ask about problems with litter box use by their indoor cats. In choosing cat litter, we take advantage of the fact that cats like to void on sandy material where they can bury their stool and urine. As long as cats use the litter box we are happy, but what happens when they start going on the carpet? Cats eliminate outside the litter box for reasons which may be medical or behavioral. In this article, we will limit our discussion to one behavioral cause termed litter box aversion which is probably the most common cause in multi-cat households. 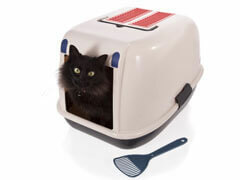 Litter box aversion is a situation where the cat stops using the litter box because it is unappealing for some reason. The most common reason is due to urine and stool odor in the box. There are other factors which may discourage use of a litter box, but good basic management can significantly reduce all causes of aversion. There are five factors in the successful management of litter boxes. The five factors are: The size and style of the box, the number of boxes, placement of boxes, litter style, and the cleaning schedule. All these factors become more important with cats that are mature in age, typically age 5 years and older. Cats under one year of age are generally the most tolerant to unappealing litter box conditions. Determine the size of box needed and whether the box is covered or uncovered. Several factors can enter into this decision. If a cat is overweight or very large, you may need a larger box and a larger door if the box is covered. Watch your cat to see how easy it is to get into the box. Are they arthritic or geriatric? Those cats may need a box with a low lip to step over. If their preference is not clear, place both a covered and uncovered box out to see which box is used most. As a general rule, households should have one more box than the number of cats in the house. If you have one cat, one box may be adequate. More cats in the house create a greater need for more boxes than just one per cat. Since cats are not pack animals, tension and stress can result when individual cats cannot find private areas for rest and elimination. Box placement should be in an area that is quiet and private. For example, putting the box next to loud equipment or appliances could prevent use of the box. If possible, don't line up all the boxes in a row but space them out a little. Don't put the feeding station next to the box since some cats will be less likely to void near their food. Cats often have individual preference for the type of litter in the box. In studies to determine preference, 70% of cats preferred non-scented clumping litter over clay. The best way to determine preference is to give your cat the choice by initially using two different litters. If cats prefer one type of litter, they will void in that box while the other litter type will remain untouched. Start by using basic clumping and basic unscented clay litter for your two choices. Generally, cats are not as interested in heavily scented litter or litter made of unusual materials. Clumping litter has some additional advantages that I should mention. It is easier to keep the box clean with clumping litter since most of the urine is removed with the clump, whereas other litters may dry and prevent identification of the urine soiled area preventing complete removal. Clumping of urine also helps owners monitor the amount and frequency of urination of their cats which is helpful in early disease identification and monitoring. Most normal cats produce two medium sized urine clumps each day. In many cases, owners are able to see evidence of increased urine volume or frequency which is common with diabetes, kidney failure, bladder infections, or thyroid disease. Keeping the box clean is undoubtedly the most important factor in preventing litter box aversion. Some cats are more naturally tolerant to soiled litter boxes. In general, young cats (especially under one year of age) are much more tolerant than cats that are over 5 years old. 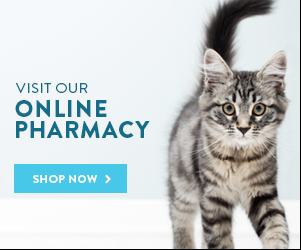 It is common to see the first episode of inappropriate urine or stool voiding with cats that are 5-6 years old. We recommend scooping out the waste twice daily to prevent the build up of odor and stool. This is usually adequate for most cats. When the litter amount is getting low, the remaining litter should be removed and the box thoroughly cleaned. With time, plastic boxes will retain urine odor and should be replaced. Another option to traditional plastic boxes is the automatic cleaning boxes. Automatic boxes are a great concept but not all cats like them and they will prevent you from monitoring the urine and stools (discussed above). In closing, by keeping the litter clean and determining our cat's preferences, our indoor companions will be happy to use the nice boxes you have provided. A happy kitty makes for a happy owner....and a HAPPY VET.